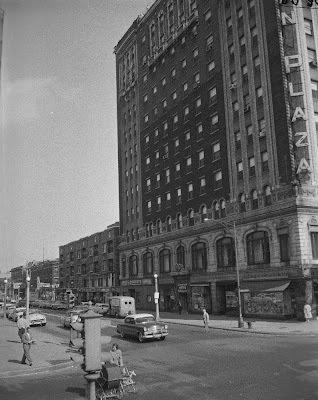 In 1957, a Mrs. Long leapt to her death from the sixth floor of the Sheridan Plaza Hotel. The photo illustrating the story for the Chicago Tribune shows the west side of the hotel, and a glimpse further north up the street at some of the other buildings. Beautiful, beautiful building. I have always admired this building as was saddened to see it so degraded. I see it's being improved and think I will go take a look to see. It's been a substandard rental building for a long time now. Let's hope it's future is better. It's one of my favorite buildings in Uptown, too.